Back in January, I knew. I believed I would join the Two Thousand Club. And I was certain it would happen this year. What I didn’t know was it would be today. Officially, I now have two thousand followers on WordPress. Technically, it’s 2008, if the statistic includes the eight who follow me only via email. 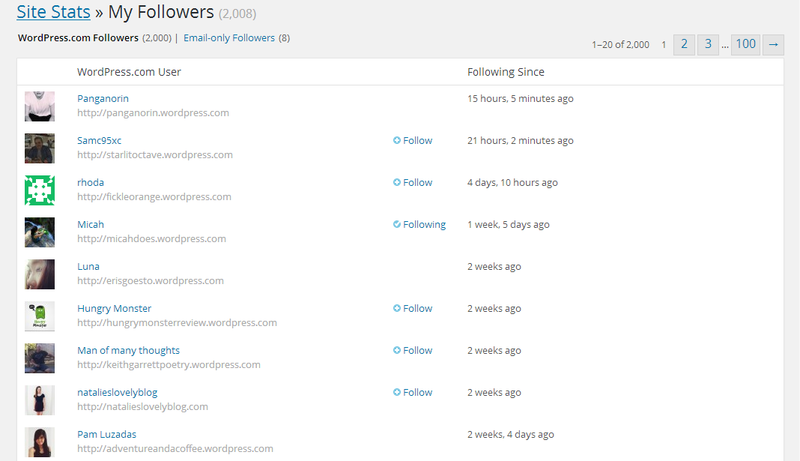 But I emphasize the WordPress followers because that is what the system prefers to tally and show first. I feel like celebrating this achievement, if only to make up for not celebrating the one thousand mark before, which I missed. Why did I miss that point? Unless I am mistaken, it happened around that time when my post was Freshly Pressed. The news knocked me out for a while that I did not notice the statistics. This time around, I am up and I am conscious! Also, I am thankful to everyone who has taken this train with me so far. It has been a crazy ride, specially this year alone, which isn’t even done yet. I hope that you, reader and/or follower, will remain a passenger and allow me to take you further. Here’s to more trains for all of us! good for you! congrats How do you people do, i’ll never know. I’d love to say that there’s a secret but even I don’t know how things happen here. But please do keep writing. Let it be as natural as possible. 🙂 Yes, I intend to… but sometimes my mind plays the bully. Congrats! Hopefully I’ll make it there someday. Just keep writing. Maybe you just might.